Glenn’s latest Pluralsight course has been published – SQL Server: Improving Storage Subsystem Performance – and is just over two hours long. It’s based on Glenn’s very popular user group/conference sessions and workshops, plus extensive work with SQLskills consulting clients and in his previous roles. We now have more than 145 hours of SQLskills online training available (see all our 48 courses here), all for as little as $29/month through Pluralsight (including more than 5,000 other developer and IT training courses). That’s unbeatable value that you can’t afford to ignore. In both my wait statistics pre-conference workshops at the PASS Summit and SQLintersection I promised to do a bunch of blog posts. The second one on the list is a simple script to allow you to capture all the reads, writes, and I/O latencies that occurred over a period of time. The original code and explanation about using the DMV are here. (c) 2014, SQLskills.com. All rights reserved. for-sale commercial tool). Use in your own environment is encouraged. In this post I explain some methods for investigating and reducing high tempdb and transaction log I/O latencies that can severely hamper the performance of your workload. I received results from 1094 random servers around the world (thank you all!) hosting 25445 databases and it took me a while to pull all the results into SQL Server so I could aggregate the data. Here it is. What is good or bad for I/O latency? Even if you have “bad” I/O latency, do you care? You may want to argue that my numbers are too high, too low, or wrong, based on what you’ve seen/experienced, and that’s fine, but this is my blog and these are my numbers :-) You may not be able to get to my Excellent or Very Good numbers unless you’re using the latest locally-attached flash storage and aren’t driving them hard with your workload. Remember these are just my guidelines, not any kind of rule that SQL Server requires. Even if your I/O latency is in what I consider the “bad” category, it could be that your workload is performing within the acceptable bounds for your organization and your customers, and so you’re comfortable with that. I’m OK with this, as long as you are aware of your I/O latencies and you’ve consciously decided to accept them as they are. Being ignorant of your I/O latencies and just accepting the workload performance as it is, because that’s just what the performance is, is not acceptable to me. For this data I worked out the average read and write latency over all tempdb data files for each instance. I didn’t see any instances where one tempdb data file had a huge latency compared to the others so I believe this is a valid approach. The tempdb data file read latencies aren’t too bad, to be honest, with more than 93% of all the servers in the survey having read latencies less than 20ms. 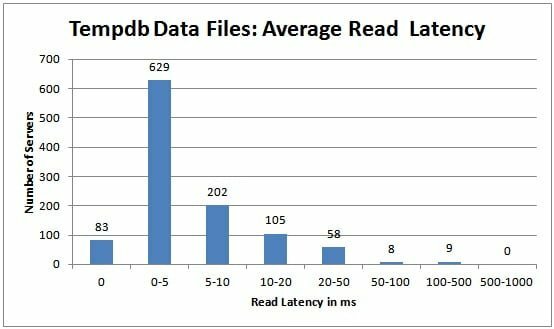 This is very interesting – almost 42% of all the servers in the survey had average tempdb data file write latency of more than 20ms, and just over 12% of all servers had average tempdb data file write latency of more than half a second per write – that’s ridiculously high! To be honest, I’m pretty shocked by these results. especially the relatively high number of servers with multi-second average write latencies for tempdb. So if you check your average I/O latency for tempdb (using a script such as the one I blogged here, using sys.dm_io_virtual_file_stats) and find that it’s really high on my (or your) scale, what can you do? Don’t do any investigation and just immediately move tempdb to a faster I/O subsystem, such as two SSD cards in a RAID-1 configuration (remember, one SSD is RAID-0, and that’s not good enough because if tempdb is corrupt or unavailable, your instance shuts down!). You might think that this is the lazy approach, but if you *know* you can’t make any changes to workload, this may be your only option. I bumped into this scenario while working with a client that supplies casino software. The optimal solution was to change some SPs to reduce tempdb usage, but that was going to take 18 months to be approved by the Gaming Commission in the state where the client’s client was located. The only solution in the meantime? Pony up for a faster tempdb I/O subsystem. Pathing/network issues, such as having a 1Gb switch in the middle of a 4Gb path, or having mismatched jumbo frame settings in your iSCSI configuration, or where the network to the SAN is being saturated by something other than SQL Server I/O traffic. Incorrect SAN settings, such as not having write-caching enabled for a write-heavy workload, incorrect queue depth compared to your SAN vendor’s recommendations, or tempdb stuck on slow storage on an auto-tiering SAN because of incorrect SAN training. Multiple users of the portion of the I/O subsystem where tempdb is located, such as having tempdb lumped in with other volatile databases, or even having LUNs shared between SQL Server and other applications like Exchange or IIS. Spill warnings in query plans (hash, sort, or exchange) indicating that there was not enough query execution memory and an operator had to spill results to tempdb. See these blog posts for more information: here, here, here, and a blog post of mine explaining how to understand the data vs. log usage for a memory spill to tempdb here. Incorrect, excessive usage of temp tables, such as *always* using a temp table when it may be better sometimes to not do so, pulling more columns or rows into a temp table than are actually required (e.g. SELECT * into the temp table from a user table, with no WHERE clause), creating nonclustered indexes on a temp table that are not used. I’ve seen this over and over with client code. Index rebuilds that use SORT_IN_TEMPDB. Using one of the flavors of snapshot isolation and allowing long-running queries that cause the version store to grow very large. A combination of #2 and #3, and then maybe you just have to move to a faster I/O subsystem, as in #1. One other thing to consider is the risk of making a change to your code and/or the cost of the engineering effort (dev and test) to do so. It may be cheaper and less risky to move to a faster I/O subsystem. Your call. Another issue you may have is that the bad code is in a 3rd-party application that you have no control over. In that case you may have no choice except to throw hardware at the problem. For this data I considered each database separately rather than aggregating per instance. For the transaction log, you really want the average write latency to be in the 0-5ms range, and it’s good to see more than 79% of transaction log files in the survey are achieving that. 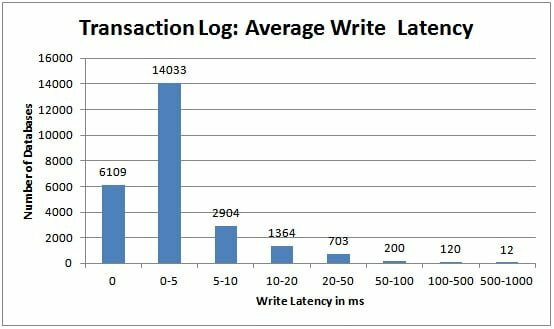 I would say that write latency for the transaction log is much more important than read latency, as write latency slows down transactions in your workload. That’s not to say that you should ignore high read latencies, as these slow down log readers (such as log backups, transactional replication, change data capture, asynchronous database mirroring/availability groups), but log read latencies don’t usually slow down your workload unless you have transactions that are rolling back (the only time that transactions will cause log reads) or you rely heavily on change data capture. 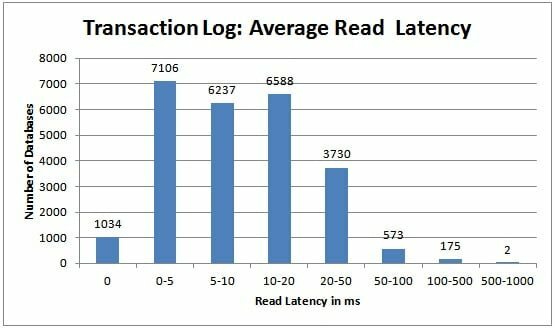 Trimming the Transaction Log Fat – common problems that lead to poor transaction log performance. Trimming More Transaction Log Fat – more subtle problems that contribute to poor transaction log performance. Transaction Log Configuration Issues – self-explanatory. And then there’s my 8-hour Pluralsight online training class that covers SQL Server: Understanding Logging, Recovery, and the Transaction Log. It’s really important that you pay attention to the read and write I/O latencies for critical components of your SQL Server environment: tempdb and transaction logs. I’ve given you a lot of info above on what you can do inside and outside SQL Server to reduce these latencies and increase your workload throughput. Unless you have no choice, don’t just throw some SSDs into the mix without first figuring out whether there are some things you can do inside SQL Server to reduce the I/O load, and if you do throw in some SSDs, make sure that you’re using them to host whatever files are your biggest I/O bottleneck, and make sure you’re using at least two of them in a RAID-1 configuration to protect against failure. I hope this has been a useful read – happy tuning!